Ryan Day says he will recharge his batteries after winning a last frame shoot-out with Stephen Maguire in the World Championship first round. The Welshman earned a 10-9 win over world number nine Maguire, who fought back from 6-9 down. 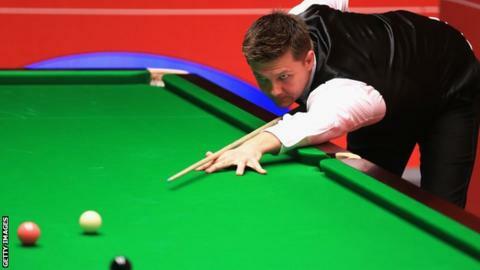 Day, who will face Judd Trump or Tom Ford in the last 16, made a break of 92 in the final frame. "I've been up here for a week. So I'll go home recharge the batteries and get in some practice," said Day. "It's probably going to be a fast, free flowing game. "They both play an attacking style. "I'm heading home because I don't play until next Saturday [27 April] and spend some time with the family." Day, 34, said that coming through the World Championship qualifying rounds helped him in his preparations for the Championships. "The qualifiers were only a few days before the tournament started and I was drawn to play on the first day. So it probably gave me a boost that I needed," he believed. Day raced into a 6-2 lead and hoped to make it 7-2 against Maguire before being pegged back. "I thought it was a tremendous match," said Day. "I played really well in the first session. I was disappointed not to be 7-2 up. "I know how tenacious Steve is and what a gritty character he is and I knew he was going to fight to the death. "I was 9-6 in front and he played three really good frames and I was surprised how calm I was in the deciding frame. "I managed to keep control of the cue ball and my emotions more importantly. "You probably wouldn't have expected that [a break of 92] in the decider. I hadn't had a shot for pretty much three frames. I was sat in my chair. "I'm over the moon to finish it off in a bit of style."